I think that with today’s technology and the direction it goes, the future of publishing is going to be digital publishing. Tablet computers and smart-phones are becoming more and more popular. on a single tablet computer that is the size of one book, you can store almost as many books as you like. These thoughts led me to explore the world of digital books. I found about the EPUB file format and that seems to me a great format for digital publishing as it does not define a page size. The actual page size is defined by the reading software based on physical characteristics of the reading device. So on a small screen device the same chapter will have more pages then the same chapter on a larger screen device. Since I like technology and like to explore behind the scenes I started learning the EPUB format. I found out that there are some free converters that I might use to convert my books to EPUB file format. However after trying some of them, I found out that they do not work well with Right to Left languages. 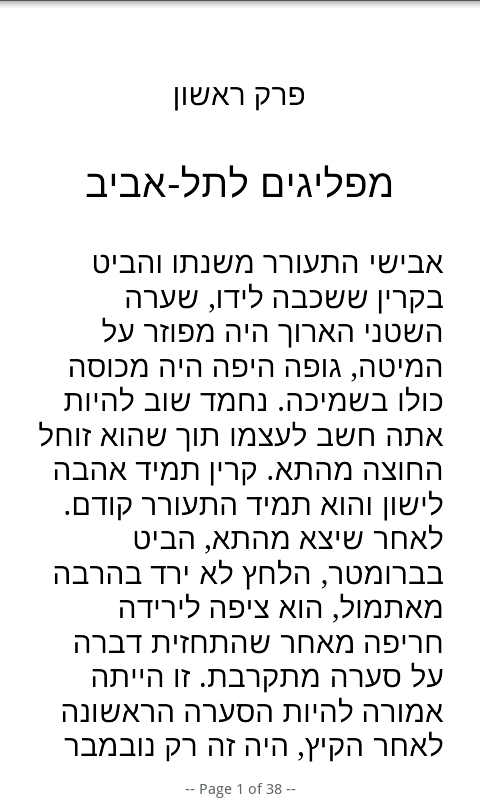 Since most of my books are currently written in Hebrew (I intend to translate them to English but it may take some time) so I had to find out a better solution. The solution was as in many other cases, writing my own software. So I wrote a set of perl scripts and XHTML files that take a series of text files each file with one chapter and convert it into one EPUB format digital book. A picture is worse a thousand words so here is the same chapter of the same book as seen on my samsung galaxy smartphone and on an IPad.